SAN DIEGO (AP) Kenta Maeda’s work in the winter is paying off for the Dodgers this summer. Thanks to his newfound changeup, Maeda pitched effectively into the sixth inning and Matt Kemp, Logan Forsythe and Chris Taylor each delivered an RBI single as Los Angeles beat the San Diego Padres 4-2 on Wednesday night. The surging Dodgers pulled within a half-game of NL West-leading Arizona with their 34th victory in 50 games. Maeda (6-5) won for the first time since June 25 as the right-hander allowed a run and four hits over 5 2/3 innings. He had nine strikeouts and a walk to help the Dodgers defeat the Padres for the eighth time in 12 meetings this season. It was Maeda’s second start since coming off the paternity list and once again he was in control as the Padres had but one hit over his final three-plus innings of work. In his last nine starts, Maeda has a 1.97 ERA with 61 strikeouts in 50 1/3 innings. Taylor’s single scored Chase Utley, who was aboard on a pinch-hit double, for a 4-2 advantage in the eighth. 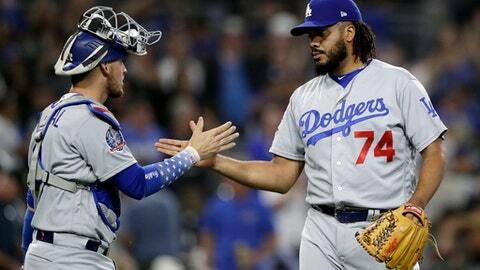 Kenley Jansen pitched the ninth and overcame a leadoff walk to Wil Myers for his 25th save. San Diego cut its deficit to one in the seventh when rookie Christian Villanueva hit his 18th homer off reliever Daniel Hudson. Austin Hedges had two of the Padres’ five hits, but San Diego lost for the seventh time in 10 games. Rookie left-hander Joey Lucchesi (4-5) didn’t last past the fourth inning after throwing 91 pitches. He allowed three runs (two earned) and six hits while losing his second straight start. Los Angeles jumped ahead in the third as it parlayed four hits and an error into a three-run inning. Kemp’s sharp RBI single brought in Enrique Hernandez after his double. Forsythe, who has struggled all year, produced an RBI infield single, and when shortstop Freddy Galvis short-hopped first baseman Eric Hosmer for a throwing error on Cody Bellinger’s grounder, Max Muncy came around. ”I guess I got out of my zone and let the game get away from me,” Lucchesi said. ”As the game moved on I felt better and better,” Maeda said. Dodgers: LHP Julio Urias (left shoulder) threw to hitters at the team’s Arizona facility, reaching 88-92 mph, according to Roberts. Padres: RHP Jordan Lyles (right elbow) threw a bullpen Sunday and was slated for another one this week. Dodgers: RHP Ross Stripling (7-2, 2.22 ERA), added to the NL roster Wednesday for his first All-Star Game, is 2-3 in his career against the Padres. He beat them on May 25 when he allowed just an unearned run over 6 2/3 innings. Padres: RHP Tyson Ross (5-7, 4.41 ERA) remains a potential trade target with the July 31 deadline approaching. Ross has 10 quality starts this year.